Do you have some great friends in your life? I hope you do! I’ve got a fun way to share a sweet piece of fun with them, with this free printable friendship card, and Juicy Fruit gum in NEW Starburst flavors! This card makes a great handmade Valentine card, or you can give it any day you just want to share some love! (Because, who doesn’t love the classic pink and red Starburst flavors?) 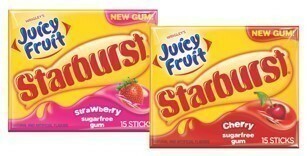 The new sugar free Juicy Fruit gum is available now at Target, in both cherry and strawberry Starburst flavors, in single packs of 15 sticks and in multi-packs. First, download a coupon to Save Now at Target! You can pick up both great flavors in stores now! Then, print the card template (which will print 2 cards) and trim them apart. Fold them twice in the center, 3/8″ apart. This will allow for the width of the gum to fit inside, and the card to close easily. Using washi tape, add the Juicy Fruit Starburst gum to your card, and write a sweet note to your besties! And that’s it. You can tie a ribbon around it if you want, or just leave it as a surprise for your favorite friend. Because fabulous friends do have to “stick” together! Which flavor are you most excited to try? Strawberry or cherry? Where is the Friends Stick together template? Please send to my e-mail. Please send Friends stick together to my email. Thank you. This card looks really cool. I will try it.